Oil and gas company Saipem has signed an agreement with KiteGen Venture to develop and commercialise technology capable of producing electricity from high-altitude wind. The Italian partners plan to use kites flying at heights of over 1km that are connected to a generator on the ground capable of producing up to 3MW of electricity. They hope to commercialise the technology within two years. Saipem, a 60-plus-year veteran of the oil and gas industry, claimed harnessing wind power at high altitude has advantages over conventional ground-based generation including greater availability and more consistent speeds. It also suggested the light weight of kites could help cut fabrication costs and generators could be positioned at shorter distances from each other than turbines at a conventional wind farm, taking up less space. The partners will first aim to develop and deploy a kite power system on land, but Saipem added it is also working on offshore deployment of the system. It stated the kite could be used in deeper waters where turbines on fixed-bottom foundations cannot be used. The kite would be tethered to a 50-tonne floating platform capable of rotating with the wind, KiteGen said. KiteGen was formed in the early 2000s and has solutions protected by 40 patents in more than 70 countries. It uses an arched-shaped wing with large-scale tenso-structural properties to resist the load, while utilising light materials such as Kevlar. It uses two cables to manoeuvre the kite by changing the length of the cables. Following ten years of development, KiteGen needs best engineering practices to commence batch production and deployment, she added. 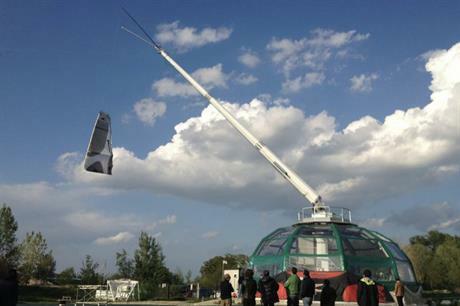 KiteGen has successfully tested prototypes at altitudes between 1km and 2km. Data from the Global Forecast System suggested at those altitudes there is enough wind to achieve a capacity factor of up to 60% anywhere in the world, the Saipem spokeswoman said. Saipem, meanwhile, has traditionally provided services to the oil and gas industry but is taking steps into offshore renewables. It installed the world’s first commercial floating offshore wind farm, and intends to increase its footprint in the industry. Saipem is not the only oil and gas company to explore the potential of kite-based wind power. Last month, Royal Dutch Shell invested in Makani, a kite developer spun off from X — part of Google’s Alphabet — and in UK-based Kite Power Systems in May 2017. More established wind power players are also examining kite power. In June 2018, developer-utility EnBW launched a research project to develop high-altitude kite power systems with EWE Offshore, the Leibniz University of Hanover and SkySails Power.